It’s been a year now since we moved to Bali and we have had so many guests – some for a few days and others for weeks (you now who you are), some couples, some families and some friends so it’s been a mixed bunch. All in all, there have been eight separate visits from friend and family near and far and each time, someone comes over, we take advantage of the opportunity to explore parts of Bali we haven’t been to aside form the usual southern areas of the island: Kuta, Nusa Dua, Jimbaran, Sanur, Seminyak and the Bukit. This time, A‘s niece and her boyfriend (a.k.a. Los “Katinos”) came over for a few weeks and on a Sunday morning, we piled into the car, all seven of us, and did a day trip to the eastern coast of Bali towards Candi Dasa. The drive is an easy one hour, on very good roads and pretty straightforward. The only thing we had to do was hug the coastline and keep going in the direction of Candi Dasa until we got to Manggis. 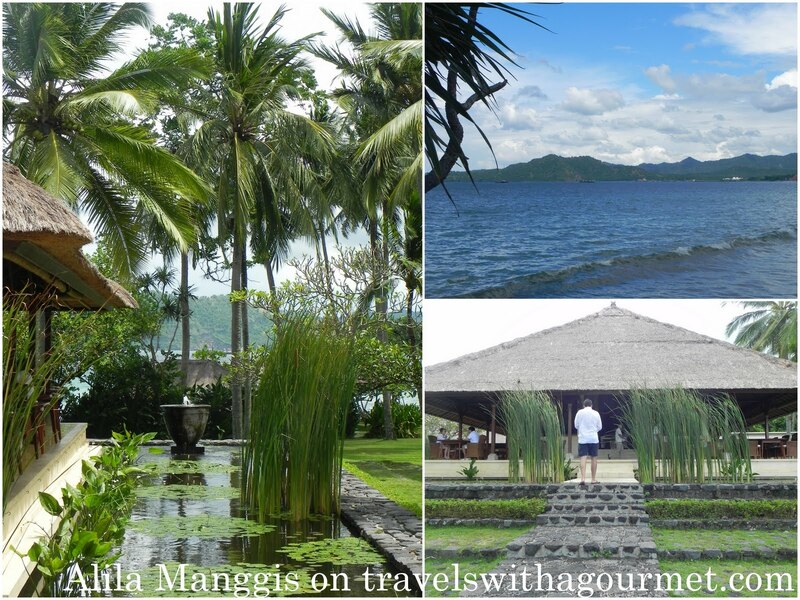 Although this part of the island is more quiet and not overbuilt, there are still a few very nice hotels around like the Amankila and the Alila Manggis. 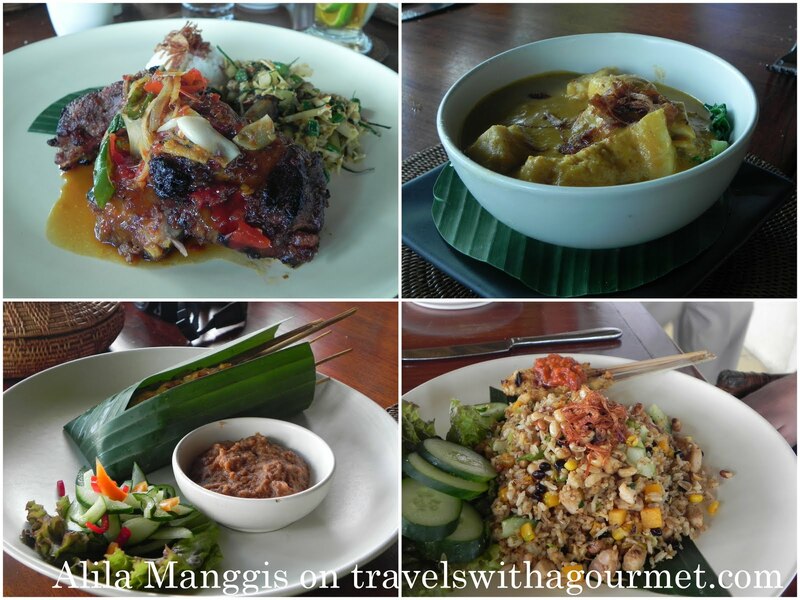 Since we were all a bit rumpled from the drive and in casual clothes, we opted to have lunch at Alila Manggis instead of the more sophisticated Amankila. The hotel is a boutique property of only 53 rooms and two suites built incorporating Balinese design with modern touches. We arrived around 1:00 p.m. and walked into an airy lobby overlooking the gardens and beyond to the nearby island of Nusa Penida looming across the water. We went straight to the main restaurant Seasalt and asked for a large table right on the front terrace with just a moat-like pond filled with lily pads separating us from the gardens and the beach. We started off with several appetizers to share: tuna, chili, shallot and lime bruschetta, crispy sesame breaded prawns with aioli and assorted fish and meat satay with peanut sauce. 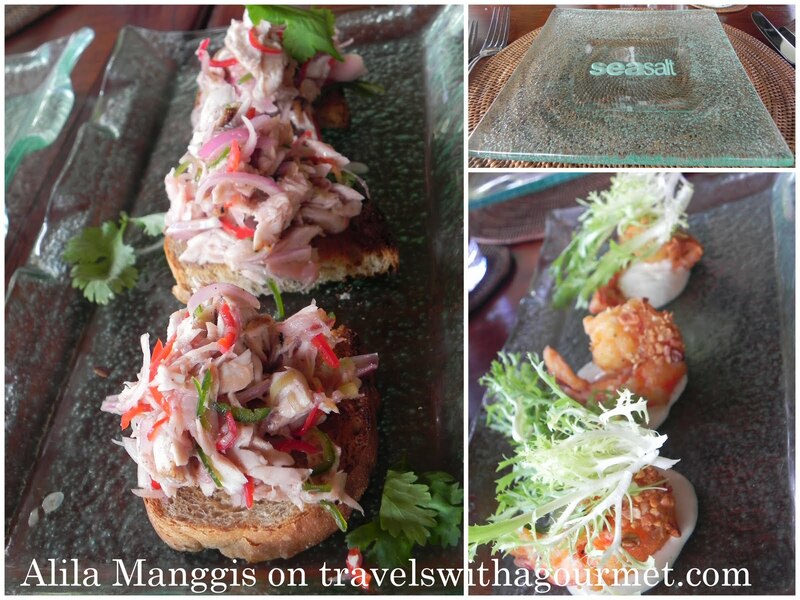 The appetizers were served with some fresh, warm ciabatta which were gobbled up quickly. Main courses came after a slight wait and since I no longer recall who had what, here they all are: nasi goreng kampung (fried rice mixed with chicken, anchovies and shrimp paste) which also came with a few sticks of satay smothered in sambal, Balinese-style babi (pork) ribs marinated then grilled and served with a reduced sweet-spicy and sticky sauce of peppers, green onions, chilis and garlic. There was also a yellow curry of chicken topped with crispy shallots and from the children’s menu, sate ayam (chicken satay) with vegetable fried rice, a large krupuk (prawn cracker) and lumpia (spring roll). M, the only one whose dish I remembered because it wasn’t Asian, chose the pumpkin ravioli in a butter and tomato concasse. We shared a couple of desserts then piled back into the car to explore the nearby village of Tenganan. 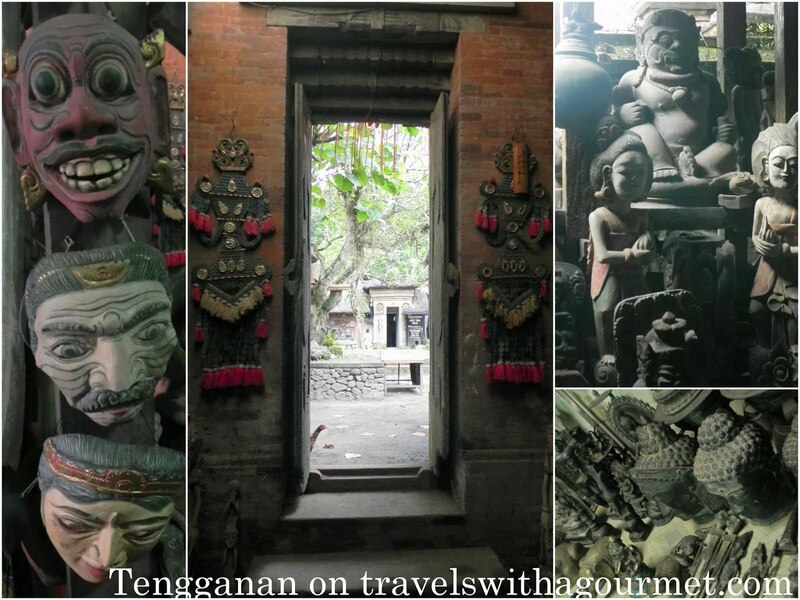 After a short drive on winding roads that seemed like they would lead to nowhere, we arrive at a clearing where the traditional Bali Aga village of Tenganan is found. Usually located in isolated mountain areas, not much has changed in this walled communal village except for a few stands where the local villagers ply their handmade wares. 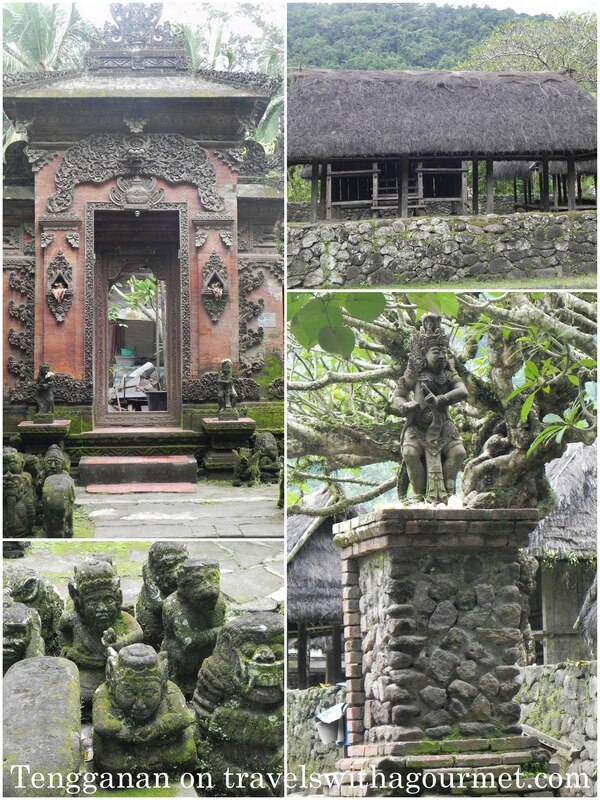 Although you can’t tell from the surroundings, the villagers from this tribe are among one of the richest in Bali. One of the things they are best known for is geringsing, a unique style of double ikat weaving which uses four colors and is only done in two other places in the world. The tribe believes that this special cloth wards off evil spirits and is therefore, an important part of tribal culture. Look beyond the typical tourist tat for sale and you’ll see, hidden away in the dust and darkness, these traditional tribal cloths that are becoming quite rare. On that particular Sunday afternoon, there was no one else at the village and it seemed shuttered from daily life. We had a quick walk around but had to cut our exploring short as it started to rain big fat drops that soon became a strong downpour and we rushed back to take shelter in the car and drive back home.